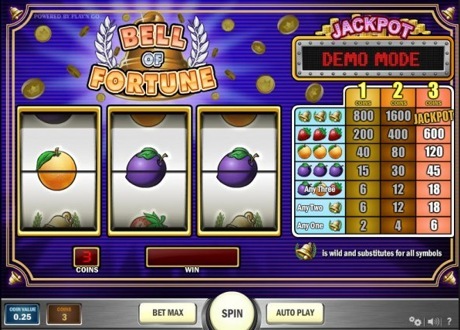 Bell of Fortune is a well designed classic slot game with 3 reels, single payline, wild symbol and progressive jackpot. The slot has a fixex €0.25 coin denomination but you can vary your bets between €0.25 and €0.75 by placing 1 to 3 coins. Betting max 3 coins per spin is very recommended as the jackpot is only available on the 3-coin bet; otherwise you'll get 800 or 1600 coins for the top winning combination. The Gold Bell symbol is Wild in the Bell of Fortune slot and it substitute for all other symbols to form any of the 7 winning combinations. The Gold Bell is also the one and only symbol of the game that pays (x2) if just a single symbol appear anywhere on the reels. 3 Gold Bell symbol would do that little magic and with the max bet of 3 coins per spin will bring you the Progressive Jackpot. Play this game right now for the chance to win a big jackpot with a minimum value of €1,000.